New success in the bleached cotton industry at Lemoine in Holland! 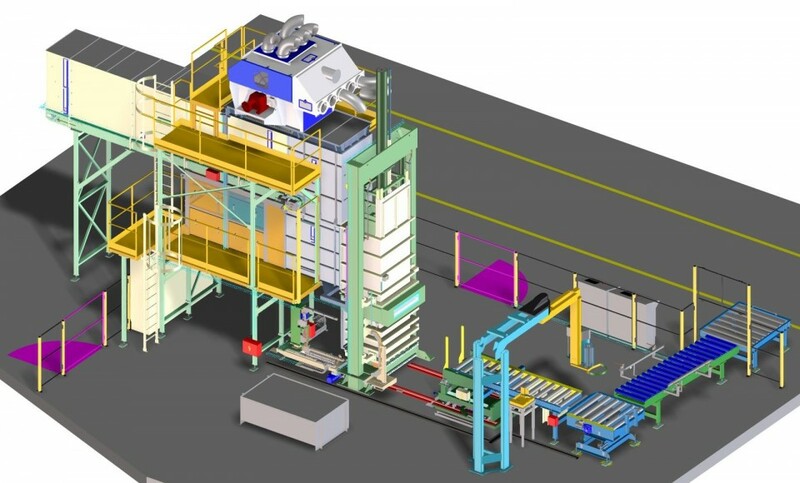 This high performance single box baling press is ideally suited for baling low bulk density materials like the bleached cotton that is processed in this project. 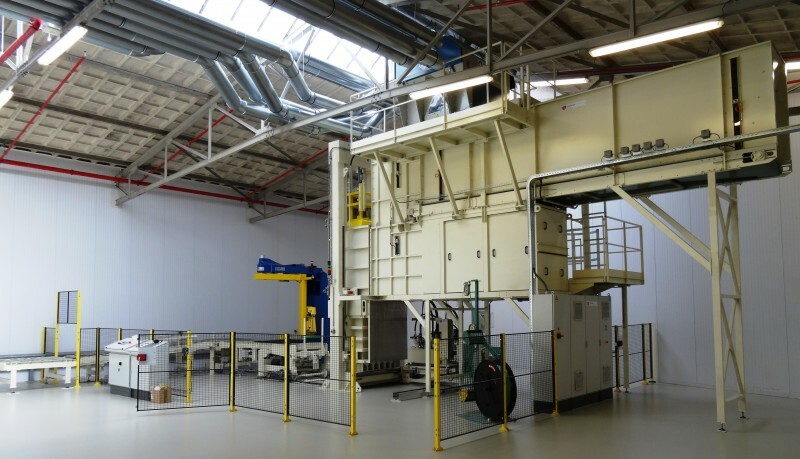 Valvan supplied Lemoine this second production line, with a complete scope from pneumatic feeding to bale evacuation. The condenser feeds the cotton fibre to the feeding belt, that serves as a temporary storage. A horizontal loader pre-compacts the material before entering the press in order to achieve a minimal cycle time. The cotton is baled with 75 tons hydraulic pressure to achieve a bale weight of 200 kg and a total production of 1.200 kg/ h.
The bales are automatically strapped with PET-strap and subsequently wrapped on 4 sides with stretch-foil. The bales are weighed and stored on roller conveyors until they are taken off by a lift truck. For this application, all parts that come in contact with the fiber are made out of stainless steel. A platform in several levels allows for easy cleaning and maintenance. The complete installation is situated inside a safety zone with secured access doors. The PLC-controlled system keep track of the production and the weights. This data logging can be exchanged with the customer’s stock management system. Introducing the new NDG40R used clothing press for export bales! With ever increasing labor costs and stricter legislation concerning operator safety and working environment, the market demands more automated machines with less and simplified manual labor. More automation also implies a higher technical complexity and a higher dependence on technology. For this reason, reliable technical equipment and maintainability are of great importance. 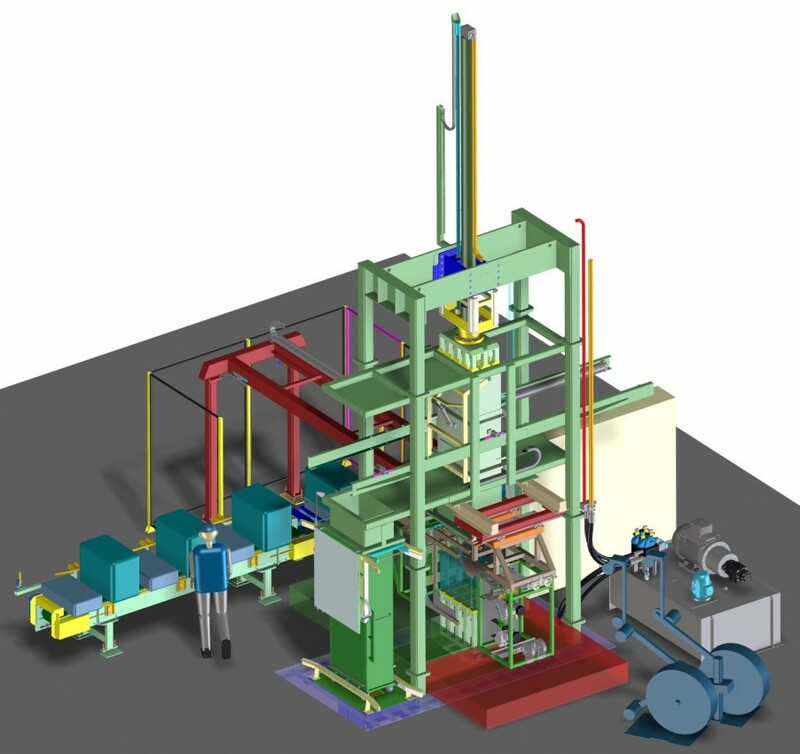 Our many years of experience in the automation of fiber presses is very useful in this respect. In answering to this market demand, we developed the NDG40R, a semi-automatic baling press with a guaranteed capacity of 35 bales/ hour with 1 press operator. We have automated the filling operation, the strapping action and the bale removal. The remaining operator tasks are light and ergonomic work. The bale weight ranges from 45 up to 100 kg. We can produce bales with a height under pressure from 200 to 550 mm. This is the highest range available on the market. By using especially designed carts, the loading of the goods can be done independently from the press and a stock of loads can be prepared. The goods can easily be loaded folded or crush-packed in the carts. The wrapping of the bale remains a manual operation in order to allow the use of different wrapping materials / colors for different items/customers. The NDG40R is the ONE press that can make ALL your export bales! We are currently building this machine in our workshop and it will be available for you to visit beginning of June. If you would like to come over for a glimpse of the NDG40R, please contact the sales manager: Gaetane Decloedt at gdc@valvan.com or call +32 (0) 56 521 383 for more information. Come and see us at Index 2014! We will be happy to welcome you on our booth at INDEX 2014 from 8 -11 April 2014, booth 4271 at PALEXPO, Geneva, Switzerland. As specialist in complete waste handling systems for the non-woven industry, we are happy to be part of one of the biggest non-woven trade fairs in the world.